Did Brevard County Schools Follow Purchasing Rules? BREVARD COUNTY, Florida - There have been suggestions made that better rules and procedures might have prevented Brevard County Public Schools (BPS) from paying millions of dollars to Educational Data Resources for enterprise software that was not delivered. But do the rules that are already in place safeguard against such improper payments, and did BPS follow those rules? I. 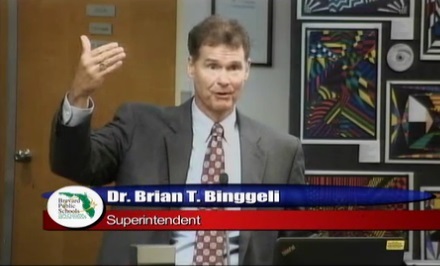 The School Board of Brevard County will not tolerate fraud or the concealment of fraud. II. This policy applies to any fraud, suspected or observed, involving District employees, outside support organizations, vendors, contractors, volunteers, outside agencies doing business with the School Board, and any other persons or parties in a position to commit fraud on the School Board. III. Fraud includes, but is not limited to, knowingly misrepresenting the truth or concealment of a material fact in order to benefit personally or to induce another to act to his/ her detriment. Actions constituting fraud include but are not limited to . . . (C) Causing the District to pay excessive prices or fees where justification is not documented . . . (Emphasis Added). IV. Any perceived fraud that is detected or suspected by any staff member or other person shall be reported immediately to Human Resource Services for guidance as to whether pursuit of an investigation is warranted. The obligation to report fraud includes instances where an employee knew or should have known that an incident of fraud occurred. Any investigation required shall be conducted without regard to the suspected wrongdoer's length of service, position/title, or relationship. Investigations shall be conducted in a confidential manner. (Emphasis Added). V. Violation of this policy may result in disciplinary action, termination of employment, termination of contract or legal action. (b) Invoices must be thoroughly reviewed to ensure that what is billed is accurate based on services rendered/goods received and what was agreed upon in the contract/purchase order. Invoices should only be recommended for payment approval if the nature, type, and quantity of effort or materials being expended are in general accord with the progress of work under the contract. (3) Before making any purchase of commodities or contractual services which the superintendent is authorized by the district school board to make or before recommending any purchase to the district school board, the superintendent shall, insofar as possible, propose standards and specifications. He or she shall see that the commodities or contractual services conform to those standards and specifications, and shall take such other steps as are necessary to see that the maximum value is being received for any money expended. (Emphasis Added). An operational audit published in January 2014 by the State of Florida Auditor General found that "the District made payments of $600,000 and $2,250,000 in April and July 2013 based on a payment schedule. However, District records did not evidence the deliverables received for these payments. Without documented receipt of deliverables before payments are made, the District may not receive all the services for which it was entitled." (Emphasis Added). Also, a Melbourne-based law firm hired by the School Board to conduct an external investigation found that the $2,350,000 software payment made on July 30, 2014, and the $600,000 and $700,000 payments made in December 2014 were improper because the software had not been delivered. The law firm also found that three separate payments of $200,000 each for software maintenance made in July 2013, August 2014, and April 2015 were improper because there was no software to maintain. The April 2015 payment was also improper because it was paid in advance of the July 1, 2015 due date. Did BPS Follow The Rules? 3. Violated BPS's anti-fraud policy by "causing the District to pay excessive prices or fees where justification is not documented." Additionally, if any BPS staff member knew or should have known of the BPS anti-fraud policy violation but failed to report the violation to Human Resources, that staff member may also have disciplinary proceedings brought against them by the School Board. Violations of these rules are not criminal, so it is unlikely that the Florida Department of Law Enforcement investigation currently underway would determine whether BPS employees violated these rules unless they are connected to additional criminal wrongdoing. BPS does have the authority to conduct its own internal investigations and hold disciplinary hearings regarding employee misconduct. If those internal BPS investigations are already in progress, they remain confidential. BPS also has the option to request that the State of Florida Department of Education's (DoE) Office of Inspector General (OIG) conduct an independent investigation into allegations of waste, fraud, or financial mismanagement within the school district. Brevard Times contacted the DoE to find out if an investigation was underway. "We have not investigated alleged financial mismanagement by the Brevard County School Board nor have we been contacted by the Brevard County School Board," DoE spokesperson Cheryl Etters replied in an email. Brevard Times asked School Board member Amy Kneesy why she decided to ask FDLE and the Brevard County Sherrif's Office to conduct the investigation instead of the OIG when a finding of criminal misconduct has a higher burden of proof to overcome than a finding of employee misconduct. "Brevard Public Schools had recently undergone a criminal investigation regarding alleged embezzlement by a bookkeeper at Southwest Middle School in Palm Bay," said Kneesy. "The Florida Department of Law Enforcement and the Brevard County Sheriff's Office investigated that incident. I turned to those same agencies again to investigate questions raised by the community regarding Brevard Public Schools' software contract with Educational Data Resources." Kneesy also explained why she hired a private law firm and private auditor to conduct a preliminary investigation instead of requesting the OIG to undertake the investigation. "I wasn't looking for an investigation into any criminal wrongdoing at the time, said Kneesy. "Instead, I hired an outside law firm to explore the School Board's contractual rights and remedies as well as determine if staff correctly followed policies and procedures. I also asked the law firm to make recommendations to the Board based on those findings."